/ Modified jan 4, 2017 5:15 a.m. The San Pedro River Aquifer provides water to people on both sides of the border. The United States and Mexico have worked together to study a major source of water in southern Arizona and northern Sonora for the first time. The San Pedro River basin is an important resource on both sides of the border. Until recently, studies only looked at conditions on one side or the other. 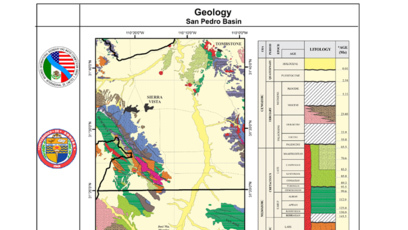 "So we know what’s going on in the U.S., but when you hit the border, everything south is just a blank," said James Callegary, who works with the U.S. Geological Survey. He said the governments of Mexico and the U.S. worked together on a comprehensive study looking at the basin in its entirety. Callegary said the most crucial part of the study wasn’t necessarily what they found, but how it was done. "We developed a level of trust that will allow this to continue into the future and be copied in other aquifers along the border." In other words, he said, the study of the San Pedro River basin has set a precedent for bilateral cooperation that bridges the border.